This experiment is included into "Copper" kit along with "The сopper, or there and back again" and "Copper tree". Subscribe and get everything you need to do this experiments at home. Place the stove on the cork hot pot stand. Do not touch the stove after the experiment; wait until it gets cold. Blue crystals do not turn white. What to do? Even after 10–15 minutes have passed, copper sulfate crystals CuSO4 do not turn white? Perhaps, something is wrong with heating the candle mould. Check that the candle is lit. 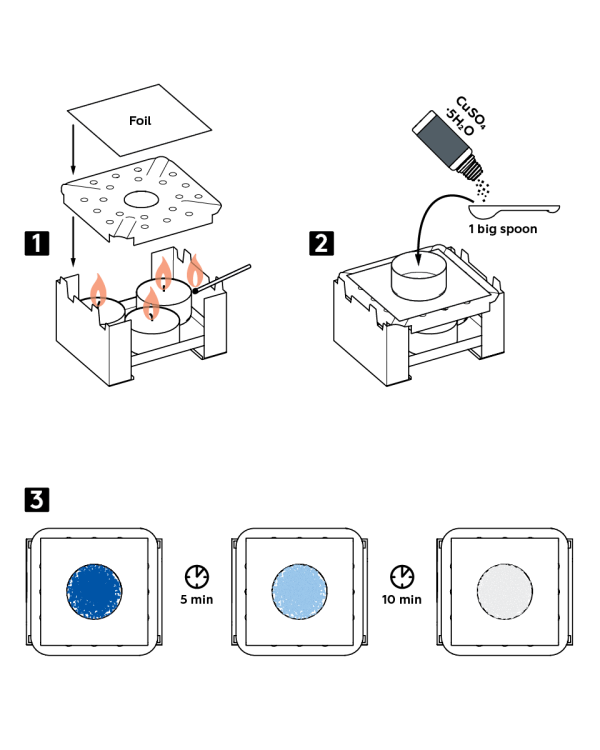 Remember that the mould has to be placed in the center of a flame diffuser, and a candle has to be centered on the stove, too. Be careful: a candle flame produces soot that is deposited on the bottom of the mould. It promptly becomes black and may leave stains. Do not extinguish it with water! Avoid extinguishing an aluminum candle mould containing copper sulfate with water! It may cause a violent reaction of aluminum reduction with release of hydrogen gas. To learn more about this reaction, read a scientific description for this experiment (see the “What happened?” section). Place three candles in the solid fuel stove and light them. Cover the stove with the flame diffuser and a sheet of foil on top. Put an aluminum mould on top of the foil. Pour in there one big spoon of copper sulfate pentahydrate CuSO4·5H2O. Watch how crystals change their color: in 5 min. blue crystals will turn light-blue, and in 10 more minutes they will become white. 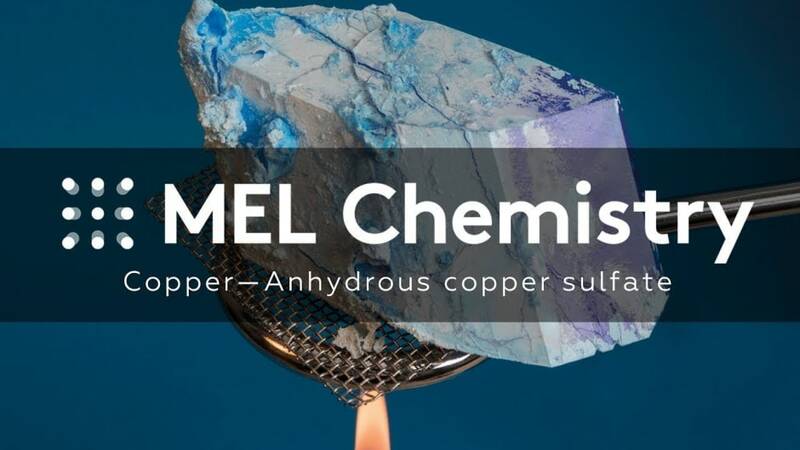 Upon heating, water contained in copper hydrosulfate evaporates, escaping from the crystals. As a result, white-colored anhydrous copper sulfate is formed. Why does copper sulfate change its color? Any change in color of a substance tells us about changes happening in its structure since the latter is responsible for color itself. 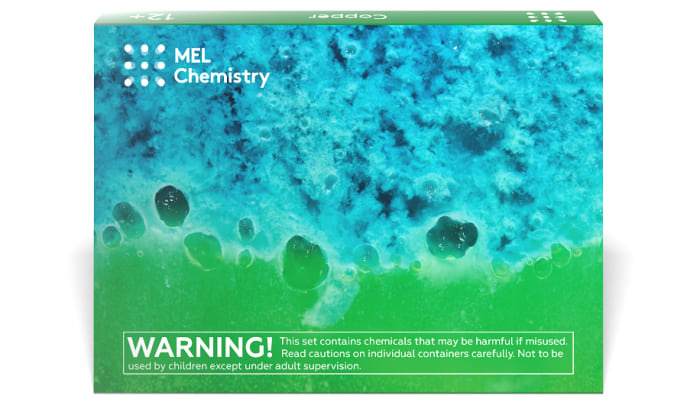 As clearly seen from an initial copper sulfate formula CuSO4*5H2O, this blue crystal compound, besides copper sulfate, also contains water. Such solid substances comprising water in their composition are often called hydrates. Water is bound to copper sulfate in a specific way. When hydrate is heated, water is being removed from it, just as boiling water from a kettle. 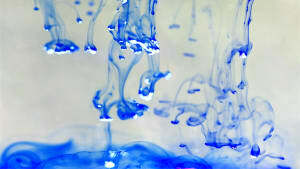 Obviously, this process breaks bonds between water molecules and copper sulfate, causing the compound change in color. First of all, a molecule of water is polar, i.e. charges are unevenly distributed within it. What does it mean? Simply put, it means that there is an excess of positive charge on the one end of a molecule and an excess of negative charge – on the other end. When they are summed up, the resulting charge is zero, as molecules are not normally charged. Still, certain parts of such molecules may carry a positive or a negative charge. Oxygen atoms attract negatively charged electrons much stronger than hydrogen atoms do. As a result, a negative charge in a water molecule is focused on oxygen, while a positive charge – on hydrogen atoms. Combined with the certain geometry of a molecule, this uneven charge distribution makes water molecules dipole (from the Greek dis, meaning “two,” and polos, meaning “pole”). Such a “duplicity” allows water to easily dissolve substances consisting of ions (positively or negatively charged particles) – for instance, NaCl or CuSO4. Water molecules can interact with them by arranging their negatively charged parts (i.e. oxygen atoms) towards positively charged ions, while their positively charged parts (i.e. hydrogen atoms) – towards negatively charged ions. And then, all these particles feel quite comfortable with each other. It explains why compounds consisting of ions are usually highly soluble in water. Interestingly, many substances preserve such an interaction when crystallizing from aqueous solutions and, as a result, form hydrates. Copper ions, as we can see from all the experiments of this set, change their color dramatically depending on what particles they are surrounded by. Both copper sulfate solution and its hydrate CuSO4*5H2O have almost the same deep blue color. It tells us that copper ions in both cases reside in identical or close to identical surroundings. Indeed, in a solution, copper ions are surrounded by six water molecules. Similarly, in a hydrate, copper ions Cu2+ are surrounded by four water molecules (H2O) and two sulfate ions (SO42–). One more water molecule (we are talking about pentahydrate) stays bound to sulfate ions and other water molecules, which resembles its behavior in a saturated (i.e. concentrated to its maximum) copper sulfate solution. When hydrate is heated, water molecules face a choice. On the one hand, there are wonderful copper ions – quite nice and pleasant neighbors. Moreover, sulfate ions make for a decent company, too. On the other hand, what molecule never dreams of freedom and adventures? Upon temperature rise, things are heating up in hydrate, and the company doesn’t seem as nice as water molecules would have liked. In addition, water molecules gain more and more energy themselves. As a result, at the earliest opportunity, they leave copper sulfate, which indeed already turned into a living hell. When all the water is evaporated from hydrate, copper ions are left with only sulfate ions in their surroundings. 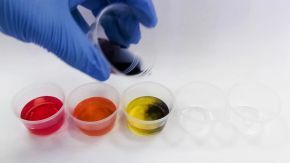 As a result, substance changes its color from blue to white. Can we turn the blue color back? Yes, we can. There is enough water around us – in the form of vapor in the ambient air. We even breathe out water vapors ourselves: recall how a window sweats when we breathe on it. If copper sulfate temperature is close to room temperature, water may “settle down” on it – almost as it does on a window. 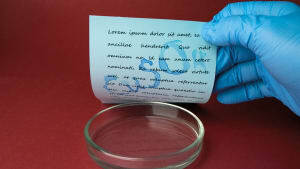 It will bind to copper sulfate in a certain way, thus, gradually returning it the blue color. However, the easiest way to make copper sulfate blue again is to simply add water! Look, how fast the color goes blue in the following video. Why may sulfate partially turn black? The reaction results in the formation of black copper oxide CuO. 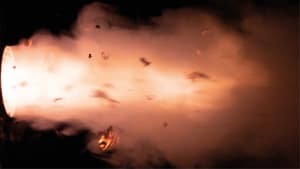 There is a rule of thumb in chemistry: if a solid substance has in its composition atoms capable of forming gaseous products, then most probably upon heat this compound will decompose with release of these gases. Indeed, under excessive heat, copper sulfate releases exactly these gases. How to make copper sulfate turn blue again? Actually, it isn’t hard at all! There are several options. First, you may simply pour anhydrous sulfate out into a plastic container (a Petri dish, for instance) and leave it open in air. Then sulfate will work as a drying agent, gradually absorbing moisture from air. With time, it will turn light-blue and then bright blue again, which would mean that the crystals composition is CuSO4*5H2O again. This option is the easiest, but it may take up to several days. Second, you may choose to accelerate the process. It would be convenient to use a Petri dish again, but this time you would need both parts. Pour all or part of white copper sulfate in the Petri dish. Now, add there a couple drops of water, placing them adjacent to but not touching the copper sulfate crystals (otherwise it would be too easy!). Finally, cover the Petri dish with its lid. In several hours, sulfate will turn blue again. This way, it will take much less time as we essentially create a “camera” saturated with water vapors. The third option is to add water dropwise, right onto white copper sulfate. Again, a Petri dish would come in handy, but you may also use a disposable cup from the Starter kit. Avoid adding too much water, though: the task is to saturate copper sulfate with water, not to dissolve it! Finally, the fourth option is to dissolve anhydrous copper sulfate. Use a disposable cup for it. You will obtain a blue solution. By the way, if you let water slowly evaporate from this solution (at a room temperature), blue crystals CuSO4*5H2O will be formed in the cup. Obviously, there are many ways to turn copper sulfate crystals blue again. Most importantly, the reaction is reversible, which makes it possible to repeat the experiment again and again, trying different methods to obtain blue copper sulfate pentahydrate crystals. What are crystalline hydrates? Why are they formed? Salts are substances composed of positively charged metal ions and negatively charged ions originating from parent acids. Some salts can form special adducts (from the English add) with water, which are called hydrates or crystalline hydrates. Essentially, an adduct consists of two or more parts. For simplicity, many compounds are called adducts to indicate that they consist of several components. Unlike conventional salts, crystalline hydrates contain water, which is called crystallization water. Indeed, it is a part of a crystal! Usually, hydrates are formed when salts are crystallized from aqueous solutions. But why does water remain in composition of a crystal? There are two main reasons. As is well known, highly water-soluble compounds (most of them are salts) dissociate into positively and negatively charged ions. Thus, the first reason is a special environment for ions – an environment that consists of water molecules. When water is slowly evaporated, a solution is being concentrated, so ions have to gather together and form a crystal. And sometimes, ions may partially preserve their environment by dragging water molecules along into a crystal. However, some salts do not form hydrates. 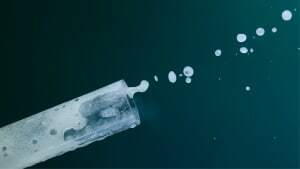 For example, when sodium chloride NaCl is crystallized, it never has water in its composition, although in a solution each ion is surrounded by five or six H2O molecules. Here, it comes to the second reason. Similar to people, each ion is looking for a more comfortable place to stay. It turns out that ions are often much more “comfortable” with water molecules than with “ions-antipodes” (as in case with Na+ and Cl–). That is, a connection between ions and water molecules is stronger than a bonding between ions within a salt. This property is more characteristic for positively charged ions: in most hydrates, water stays in their surroundings. This phenomenon is caused by an electrostatic attraction between “+” and “–”, i.e. between ions and water molecules. In a water molecule, an oxygen atom has a slightly negative charge, while hydrogen atoms each carry a positive charge. All crystalline hydrates decompose under heat. At temperatures above 100oC, water normally exists in the form of vapor. Therefore, water molecules have to leave hydrates at such conditions.